You know when my wife was taking the photos when you have one from every side of the box. After visiting Tanzania, Ethiopia and Kenya, the last African country on our honeymoon was South Africa. This was the only country one where we could try McDonald's as all the other country's have yet to get one. Though we spend the first 4 days in the country in Cape Town, our flight to Hong Kong was from Johannesburg, so during our day there, I finally stopped into a branch to get the Texan Burger. This was the second of three burgers in the "Tastes of the World" series, with the each burger running for an entire month. I missed the Mexican Burger which came before, as well as the South African burger which came after, but at least I had the chance to try something. It didn't look like much before you opened it up. Look at all those sauces! That hashbrown is looking a little limp. Like the other Texas Burger's I've had, again, aside from the name, this one was totally different from the others. It was thick beef patty with a tonne of sauces on top, mayo, BBQ sauce, as well as a Jalapeno sauce (which was also at the time available as a McNugget dipping sauce). Under the beef patty was a hashbrown, and the bun was a semi-premium sesame seed bun. There was also cheese and bit of grilled onion, tomato and lettuce and tossed in there, but with the sheet amount of flavours going on, you wouldn't really notice. It doesn't look like much when it's been crushed down. At first, I didn't think it was going to be all that good. 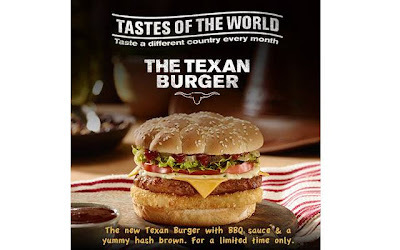 With all the sauces on there, it looked a mess, and the hash brown looked limp, but actually, I was more than impressed when I took the first bite. Unlike some of the promo beef burgers, this beef (as was all beef I had in ZA) was pretty tasty and juicy. The trio of sauces, though it made a mess everywhere worked out surprisingly well. Naturally, the BBQ sauce was the strongest of the three, followed by the mayo and then the jalapeno sauce. Unfortunately the sauce wasn't spicy, but it at least had hits of flavour that you would expect in a jalapeno sauce. The hashbrown was probably the least exciting bit of the burger, it's like it was included as an after thought, it tasted like a hashbrown, and it didn't ruin the burger, but I don't think it added much to the flavour. I would have never thought a burger with 9 different flavours going on would have worked so well but it did. The ingredients seemed noticeably nicer than the ones I usually have in Asia, from the beef to the sauce, everything just seemed a little bit 'better'. Also, at the price point you really couldn't complain either. Back in Canada this would have been $6-7, but inclusive of the 14% VAT, it only came up to around $3.70. I didn't order it as a combo since were wanted to have a proper lunch, but I did order something to go with it, which I will review shortly, so keep an eye out for that. 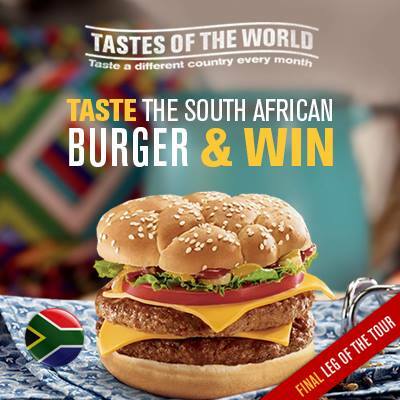 The final burger of the series was the South African Burger, which uses South African spiced sausage. It really wish I had a chance to try this one, but sadly we were already back in Singapore when it was launched.